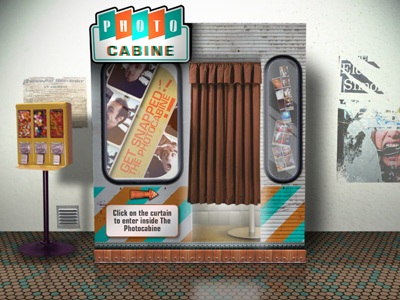 La Photocabine is fun website that simulates a photo booth. Visitors can step behind the virtual curtain and take silly pictures using their computer's web cam. Then choose color or black and white, pick a vertical or square arrangement, and print, share, or download the file. Try it here. You're not gonna show us the pics you took?! Oh. You don't? How old is your computer? How fun! Downloaded the App, too. Pretty neat-o! 5 years... from the dinosaur age. Aw. You should save up for one. It'll really benefit! Anyway, it's so cool! This is so clever! I will download this app! Thanks, Jessica... this was neat! Matter-of-fact, I like all your time waster suggestions! hey, that's cool. and it's also available as an app for i*phone. it's called pocketbooth. great fun!!! Do you think it's legal for passport photos...? I cant get it to work??? Fun! Will check out the iPhone app, too! This is so cool! Love it! I always wanted to get my picture taken in a photo booth when I was little, and now feel so silly when I get the urge to spend $3 at the mall to do it now...this is perfect, I can do it from home, for free! This was awesome! Thanks for posting.